Another marketer recently told me that she missed a bunch of lead referrals from Microsoft because there was typo in the email address on their Microsoft Partner Center (formerly Pinpoint) profile. Once she fixed the typo she received 3 leads in less than a week. It took me some time to figure it all out, check my company’s profile, find the referral section and confirm it was working as it should. So consider this your “cheat sheet”. According to Microsoft: “Customer-entered keywords are matched with partner declared business profiles creating a shorter list of partners. Customers can use filters to narrow down their choices of partner based on location and customer size. Best Match category uses competencies and input from Microsoft individuals to surface partners. Most Responsive category uses data on partner responses in referral management experience to surface partners. Nearest to You category takes partner proximity from customer entered location into account to surface partners. If your profile is not showing up the way it should, the next step is to edit your business profile. If your profile is incomplete or inaccurate it will be harder for prospects to find you. PLUS, I happen to know that Microsoft employees use these Partner Center profiles to assign leads too. So it is important to follow these steps to edit, and improve, your business profile. 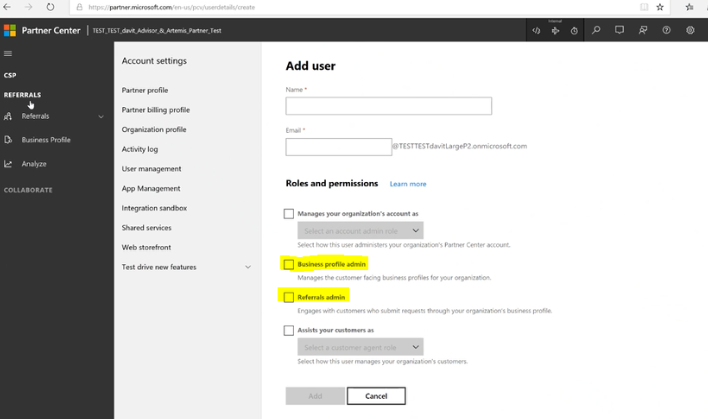 1) Sign in at https://partner.microsoft.com/en-us with your Microsoft account* and click “Dashboards”. 3) From here you can choose an existing profile or choose to create a new business profile. o Use a simple, high-resolution, and professional version of your logo, since it will be displayed as a thumbnail. You can upload your logo as a GIF, JPG, or PNG file, with a max width of 300 pixels. o Take the time to write a good description that is brief and engaging, and will give prospects a reason to keep reading beyond the description. Remember that large blocks of text are hard to read online, so consider breaking up the text with bullets points. o This is not a personal LinkedIn page. Don’t have a business page? Create one here. o Choose the industries where you focus. Selecting every option will just be confusing to prospects. .
o Only add legitimate business locations. o When adding an email address consider creating a distribution email list so more than one person will receive referral notifications. 5) Click the box “I accept the Microsoft Partner Center referrals terms and conditions”. Note: Microsoft says there are two other tags used in search but it seems these are added automatically, so I don’t think you have control over them. Once you publish your profile, it will be ready to receive referrals (aka leads) within 24 hours. I will cover that in my next article. * Wait, why can’t I access any of this stuff? • Business profile admin privileges to a marketing professional in your organization who manages the customer-facing business profiles. • Referrals admin privileges to a sales or marketing professional in your organization who engages with customers who submit requests through your business profile. Without these permissions, you will not be able to edit the Business profile or manage the referrals. Sign up with your email address to receive tips.